September 18, 2013, Clermont, Fla.—We all know that it is the little things in life that make the difference. When you are staying in a motorized RV (a traveling hotel), one of the little things I appreciate is a washer-dryer. Our last RV had a stacked unit. 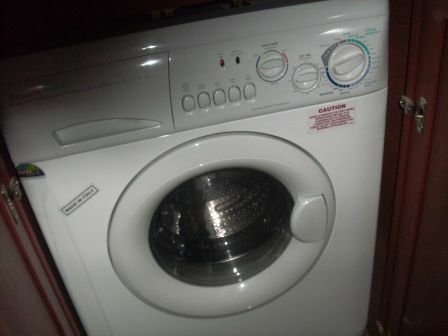 This one has a combination washer-dryer. I prefer the stacked unit. Although it washes smaller loads than the machine I have at home, I think it is more efficient than the combo. However, let’s be real: Having a combo unit is much, much better than not having one at all. We’ve had this motorhome since last November, but because of Jim’s accident, we haven’t been able to go away for the last three months. The previous trip we took in this RV was only for a few days to Tampa. This trip we have been gone since last Saturday, and we’ve been hooked up to sewers every night. So, it was time to try out the new unit. Because we have had some unwanted surprises with this RV, I hoped the washer-dryer would work. It will take some getting used to washing much smaller loads of clothes than I am used to, but at least I will be able to keep our wardrobe clean. Another little thing...being near an IKEA store. The weather has been rainy today. (Yesterday at Epcot we were lucky. When it rained, we were always inside.) Because of the iffy weather, we decided to go down to IKEA with the specific purpose of looking for new dishware. We found the dishware we wanted—plus plenty more. It was a good shopping spree, and IKEA never takes a big bite out of the budget. The weather is still drizzly, so we have decided to forego Magic Kingdom this evening. Disney will be there for another time, should we decide we need a Mickey fix. Home tomorrow. 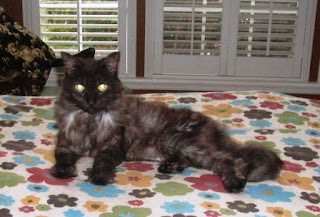 I’ll give you report on how Charlie (the recalcitrant cat) made out on his own. 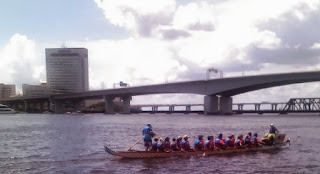 September 18, 2013, Clermont, Fla.—Oh, my aching feet! And back. And legs. We went to Epcot yesterday, and I swear, I think we walked 100 miles. At least it felt that way. The last time we were at Epcot was before I had knee surgery, and we did not have an electric scooter. I was wearing a knee brace on my left leg. We got half way around the “world” and I really couldn’t go any farther. We had to rest and finally retreat. Fortunately, except for one attraction, we did not have to wait in long lines, thanks to the fact that it is September and kids are in school. The one attraction was worth the 35-minute wait, however. It was Soarin’—a simulated hot air balloon ride over California’s scenic areas, from the desert, to the ocean; from the cities to the mountains. It was wonderful! We felt as if we were really in a hot air balloon. We only had to wait about five minutes for the other attractions we visited, including the GM race car, which hit a top speed of 65 mph on a straightaway and experienced hairpin turns. We were only in line for a few minutes for the space-training attraction. For that ride, you had a choice: To be an “orange” trainee (which meant more severe training) or a “green” trainee (which meant a milder ride). I chose the green—the first time. After it was done, we rode the attraction again, and I chose to be an orange trainee. Wow! We blasted off and felt the Gs! Awesome. Singers entertained us while we waited for an animatronics feature at the American pavilion at Epcot. Disney has always done a good job on animatronics. Now these humanlike robotic figures are really lifelike. 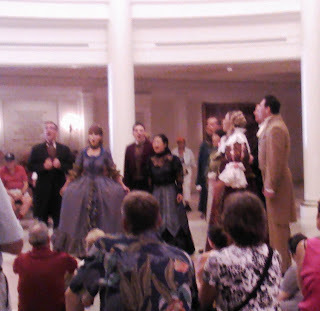 I especially appreciated them in the American pavilion, where Thomas Jefferson, Ben Franklin, Mark Twain and others walked and spoke to each other and to the audience. The night that we arrived here (Monday), we went to Downtown Disney. There we found street entertainment, as well as free boat rides across the lake. Very enjoyable. Our only disappointment was that the Cirque store was closed. In fact, Cirque du Soleil was “black” for this week. We weren’t planning to go to the show, but I wanted to get a coffee mug at the store. When we went to Cirque a few years ago for my birthday, we either did not purchase a mug or we did and it broke. I guess I’m destined not to have that coffee mug in my collection. 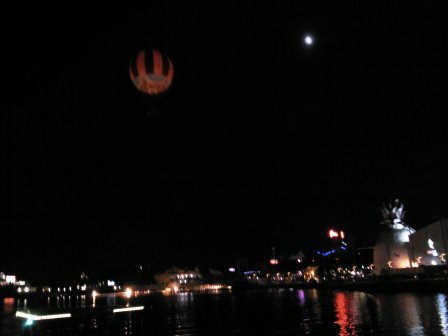 Downtown Disney has a tethered hot air balloon that rises 400 feet. I captured it with my phone camera, next to the almost full moon. Today, thanks to the passes Jim’s son and daughter-in-law gave us (thank you! ), we may go back to Disney, probably to the Magic Kingdom, where there are some new attractions since the last time we were there (several years ago). The verdict on whether we go back lies in how Jim’s aching bones feel. As I post this, he’s still asleep! September 16, 2013, Hobe Sound, Fla.—When Jim was in the travel business in the West Palm Beach area, he was active in Bon Vivants, a business-social club for travel industry personnel. 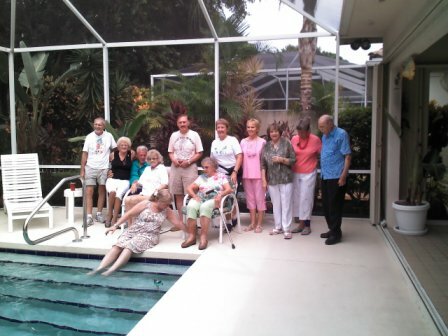 Several times a year, the group traveled to various sites on mini-vacations. Occasionally a trip was a mystery to everyone except the person who arranged it. Anyone who wanted to take part had to pay up and have faith in the coordinator. Twenty-five years ago, Jim arranged a mystery trek to his favorite place: Jamaica. Everyone who went on the trip was having a great time—until Hurricane Gilbert threatened the island. According to members of the group (who reunited this weekend at a member’s home in Palm Beach Gardens), no one, including the hotel personnel, was aware that a hurricane was pending. (Remember: This was 25 years ago. The sophisticated hurricane alert systems we are accustomed to today were not yet invented.) One of the people was listening to an old transistor radio she had taken on the trip and heard a warning. She rushed up to the hotel, told the staff of the impending danger, and then everyone went into action. Gilbert was no ordinary hurricane. It was a category 5—the worst label a storm can get. (Hurricane Katrina, which hit New Orleans in 2005 was a Cat 5.) Jim recalls watching the storm whip the palm trees so severely that the fronds lost their chlorophyll and turned white. He said he witnessed a sheet metal roof being torn off a building and hoped no one was in its path. The noise from the storm was tremendous. Jim slept in the bathtub, a relatively safe place to be when the storm hit. It was a scary time, but some people made a party of it. A group of young travelers (not in Jim’s group) had a huge “ganja” party. The smoke wafted through the walls into the adjoining hotel rooms. Others played cards or board games. A lot of people sampled the local rum. After the hurricane passed, the group again pitched in to help the limited hotel staff feed everyone who was there. Guests in this hotel were lucky. Their food wasn’t fancy, but at least they were able to eat some hot meals. Gilbert extended the group’s stay by four days. When they were finally able to go home, they were dirty, sweaty, and thankful. They were also surprised when the hotel tried to bill them for the extra days they spent there—despite all the help they contributed! (The hotel rescinded the billing.) Their ordeal made the front pages of the Palm Beach Post. This year’s reunion won’t make the headlines, but a newspaper covered the party and took pictures. The reunion of the Gilbert Survivors was a huge success. The numbers of those survivors are dwindling, but everyone said they wanted to have another reunion next year. September 15, 2013, Hobe Sound, Fla.—Sometimes the simplest problems elude solution, especially when you are tired after a long day’s journey. When we arrived at Jonathan Dickinson State Park, here in Hobe Sound, yesterday afternoon, we did the usual things: Hooked up sewer, water, and electricity; put out the three slides; leveled the motorhome. I then went about organizing our furnishings and setting up the computer, while Jim eagerly tried to set up the satellite system so that he could watch the FSU football game. He couldn’t get the front TV to come on, and he couldn’t identify why. About the same time, he also discovered that we were not drawing the proper amount of amperage from our electrical hookup. Instead of having 50 amp service, we were only getting 30 amps. We called the park rangers, who came out and tested our electrical hookup. (Surely it was the park’s problem!) Unfortunately for us, the hookup was fine. The power problem was ours. With that realization, we then discovered that we had no power on the entire left side of the RV. We had had it earlier; now we didn’t. What happened? We didn’t know. But it was getting late, and we had had a long day (which included dinner with Jim’s West Palm family), so Jim decided he would tackle the problem in the morning. The power problem aside, we also had another annoying challenge: Ants! When I opened the cupboard I found hundreds of big ants feasting on an open package of hard candy. I think we brought them from Jacksonville. We also found trails of smaller ants, which got into the cat food. I think those are of the Hobe Sound variety. Regardless of the ants’ genesis, ant spray works wonders, and that problem is mostly contained. Back to the power situation. When we awoke this morning, Jim started researching possible causes. Electricity was getting from the hookup to the motorhome, but it was not getting to some of the lines. He opened the breaker panel and checked to see if power was getting to each of the breakers that supply electricity to the left side of the motorhome. Power was there; it had to be another cause. He started researching again and somehow stumbled upon reference to a GFI breaker. GFI breakers are usually located near water sources. They are a safety feature. We located the GFI for the coach, found that it had tripped, pushed it on, and voila! We had electricity, including 50 amp service! What caused the GFI to trip and leave us half in dark we don’t know. But now we have hot water, power to all the receptacles on the left side of the coach, and even TV! Problem solved. Sept. 15, 2013, Hobe Sound, Fla.--Earlier today, I posted a picture of Jim standing atop of our RV, using a pressure washer to remove the three months’ worth of dirt that had accumulated since our last trek, which was in February to Tampa. We had planned to travel during the summer, but a couple weeks before our trip was to begin (on May 23), Jim had the misfortune of falling off the roof of the RV. The eight broken ribs are mending, as are his clavicle, scapula, hand, and foot. He continues his physical therapy, and the doctor has given him the OK to resume normal activities. I did not want “normal activities” to include going up on the roof. But men—especially my man— are stubborn. It took about two hours to clean the roof—a long two hours. This was on Friday. 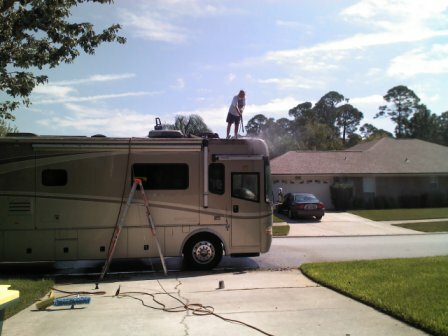 It took us another couple of hours to pressure wash the rest of the RV, in preparation for a trip to the West Palm Beach and Orlando areas. The real story of this trip, however, began yesterday (Saturday) morning. We had parked our RV in front of the house so that we could pack up and get an early start. It didn’t take too long to pack up the food and clothes. The final thing to put on board was (you guessed it! 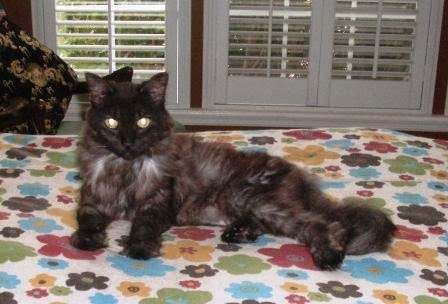 ), the cats. Charlie? Well, as you know, he is our scaredy cat. 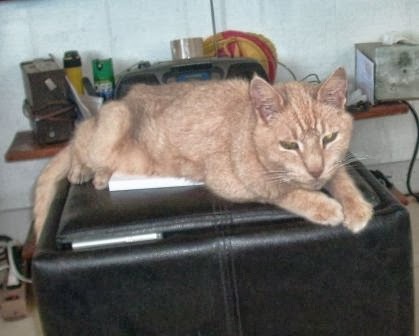 He is the one who hid so completely in a cubby hole in our first RV (“Baby”), that we thought we had left him in Yuma, Arizona. Charlie seems to have a nose for intuiting that we are going to travel, for when it came time for us to transport him into the RV, he was nowhere to be found. We finally decided he would have to get along on his own. (Cats can do this.) We left him with a clean litter box, access to the outdoors, a full water bottle, and a full bowl of food. We also left all the doors to closets and the garage open a bit, in case he was hiding. We didn’t like leaving him, but we had no choice. I image he will be especially grateful to see us when we return Thursday.